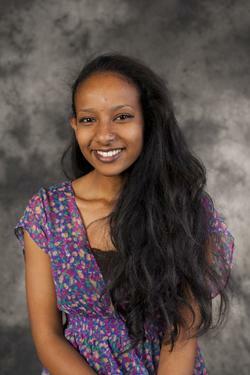 Senior biology and anthropology major Hazar Khidir completed biology research at the Stanford University School of Medicine in Stanford, Calif., through the Amgen Scholars Program this summer. The program provides undergraduate research opportunities to selected students at some of the top-ranked universities in the nation. Khidir focused her research on genomics, specifically determining the mutations that are responsible for rare Medalian diseases. The research lasted eight weeks spanning from mid-June to mid-August. After working in a research lab at Truman, Khidir decided to apply to the program. “I’m really interested in integrating biomedical research into my future career. This program seemed like a really great fit for my interests,” Khidir said. The experiences Khidir had completing the program helped shape her future career aspirations. For students interested in completing summer research, Khidir recommends applying to multiple programs. For more information on the Amgen Scholars Program, visit www.amgenscholars.eu. 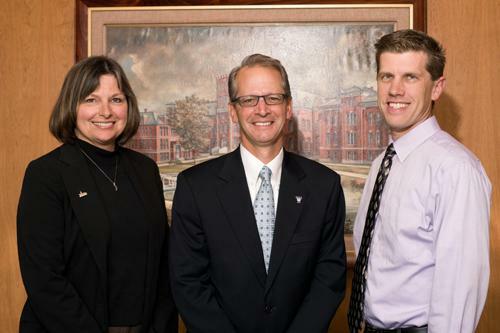 Truman’s 2011 United Way Campaign began Sept. 15 with a goal of $56,000. All faculty and staff members should have received information about the campaign through campus mail. Individuals who did not receive campaign information, or have questions, may contact co-chairs, Tony Vazzana at tvazzana@truman.edu or Sally Detweiler at sallydet@truman.edu. University President Troy Paino; and Tony Vazzana, co-chair. Donations support the United Way of Adair County, with all funds staying in the area. The local United Way has among the lowest overhead in the nation, allowing a greater percentage of contributions to go straight to local programs helping people pursue the goals of education, income and health. Recent statistics show the United Way touches one out of three individuals in the area. For the 15th year in a row, Truman has been recognized as the No. 1 Public Regional University in the Midwest by U.S. News & World Report’s 2012 edition of “Best Colleges.” They also ranked Truman No. 8 overall in the “Best Regional Universities” category among both private and public institutions that provide a full range of undergraduate and master’s programs. Truman received a No. 3 ranking in the Midwest Region for “Strong Commitment to Teaching” which is based on surveys that identify schools where the faculty have an unusually strong commitment to undergraduate teaching. The Undergraduate Research Program was also highlighted in the section titled “A Strong Focus on Student Success” which lists schools that are recognized for outstanding programs aimed at enriching the experience. Truman was included as the No. 5 school in the Midwest Region on the list of “The 2012 Up-and-Comers” for making “the most promising and innovative changes in academics, faculty, students, campus or facilities.” Truman is the only Missouri school listed. The University is listed at No. 7 in the Midwest Region on the list of “Great Schools, Great Prices.” This best value ranking takes into account a school’s academic quality based on its U.S. News ranking and the 2010-2011 net cost of attendance for a student who receives the average level of need-based financial aid. U.S. News & World Report bases its regional rankings on peer assessment, graduation and retention rates, faculty resources, student selectivity, financial resources and alumni giving. Complete listings are available at www.usnews.com/colleges. Truman was recently ranked by the Washington Monthly as the No. 3 school overall in the Master’s Universities category and is the only Missouri university listed in the top 50 of the category. Truman topped the list of the 14 public universities recognized by the magazine. Eight nursing students from Truman traveled to the Philippines May 20-June 12 to gain clinical experience with patients from a transcultural perspective. Through classes about cultural immersion and communicable diseases last spring, students prepared for their trip. The experience was divided into two parts. The first was a week-long stay in Manila, where students participated in maternal and nursery care at the non-profit government facility, José Reyes Memorial Medical Center. Here students were exposed to caring for mothers and infants who generally could not afford health care. They developed competencies in the assessment of birthing mothers and newborns and in cross-cultural communication. Four students completed 24-hour shifts in the delivery room. Students also had the opportunity to observe and assist with patient care in units of their choice, including the operating room, PICU, burn unit, ER and pediatric ward. 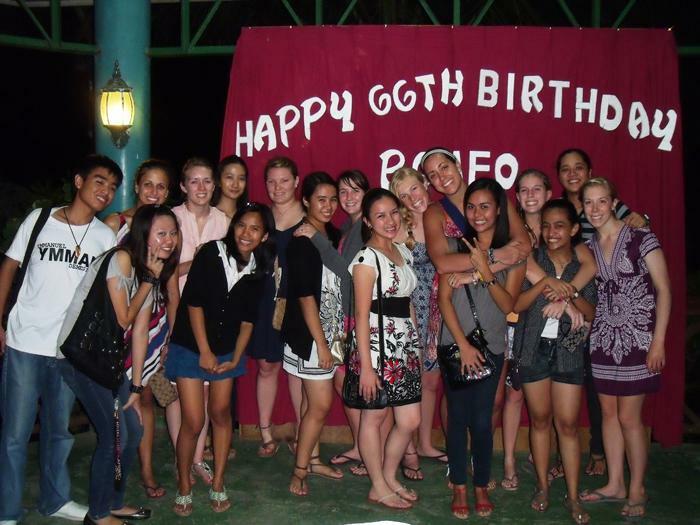 Truman nursing students with their nursing buddies from West Visayas State University in Iloilo City, Philippines. From Manila, they traveled south to the central province of Iloilo City where the students enrolled in the 12th Transcultural Nursing Program at West Visayas State University. Clinical experiences in Iloilo included Asilo de Molo (the sole nursing home in Iloilo), home visits to Barangay Napnud, social hygiene clinic and a leprosarium, as well as hospital rotations in the medical, pediatric and surgical wards of WVSU medical center. Communication and cultural accommodation were facilitated for the students during clinical experiences by nursing students, buddies, from West Visayas State University. The senior nursing students who participated were Kayla Aydelott, Emily Berenz, Sarah Brown, Allison Harper, Lauren Lampe, Andrea Russell, Molly Wersching and Amy Wiley. These nursing students will present a program, “Transcultural Nursing in the Philippines” at 7 p.m., Oct. 4 in the Student Building Alumni Room. The public is welcome to attend and refreshments will be served. Junior nursing major Courtney Oxandale was chosen the winner of the “Sweet Internship Photo Contest” hosted by the Career Center this past summer. Students interested were asked to submit a photo and a written statement of their internship experience. Courtney Oxandale’s winning photo shows her posing with her students. Oxandale was voted the winner by Career Center staff and the deans of different schools. 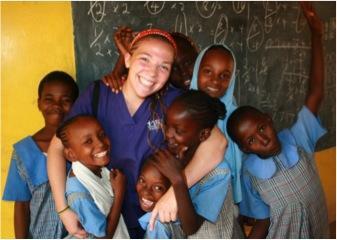 She spent eight weeks in Kenya, Africa, where she worked as a student nurse and teacher. She spent her mornings helping with tuberculosis, HIV/AIDS, prenatal, maternal and wound care in a local clinic. In the afternoons, she worked as a fifth grade science and math teacher at a school of 243 students. She lived with a local Kenyan family and commuted to work everyday. To learn about the other contest entries, sign up to receive the Career Finder newsletter at career.truman.edu. The Missouri Government Internship Program offers a unique opportunity for students to intern at the Capitol in Jefferson City, Mo., with a public official, legislator or state agency during the Spring 2012 semester. The program provides students an inside look at state government and the political process. No special coursework is required prior to the internship. Successful applicants will be of sound character and possess qualities that reflect positively upon themselves and the University. Students interested in learning more about the internship should attend the informational meeting scheduled 5:30-7 p.m. Sept. 26 in Student Union Building Georgian Room C.
For more information, contact Heidi Templeton at 785.4016 or heidi@truman.edu, or Candy Young at 785.4650 or cyoung@truman.edu. The Dr. Emmanuel Nnadozie McNair Endowed Scholarship is being awarded for the first time this year. The scholarship was established in honor of Dr. Emmanuel Nnadozie, first director of the McNair Program at Truman. The fund has received many gifts from staff and faculty. It is an endowment and is open to additional gifts. The goal of the scholarship is to assist individuals who are first generation college students and also come from low-income family background. To qualify for the scholarship, students must be participants in the McNair program. Students who will be applying to the program this fall are also eligible for the scholarship, pending acceptance. Applications are available online from Oct. 1-Nov. 1 at secure.truman.edu/isupport-s/scholarships.asp. The McNair program’s mission is to increase Ph.D. degrees achieved by underrepresented segments of society. Since receiving its first grant in 1992, the program has produced: 28 alumni with Ph.Ds., 39 currently enrolled in a Ph.D. program, 145 alumni with master’s degrees and 31 currently enrolled in a master’s program. The Truman theatre department is presenting the first production of the 2011-2012 season, “Melancholy Play,” by Sarah Ruhl, at 8 p.m. Oct. 5-8 in Ophelia Parrish James G. Severns Theatre. The play is a surreal farce about a young girl named Tilly whose melancholy appears irresistible to others. One day she turns happy and all goes unexpected. Admission is free. Tickets may be reserved by calling the Box Office at 785.4515. This event is sponsored by the English and Linguistics Department. The Career Center is hosting mock interviews with employers from all majors on Sept. 29. Sign up by Sept. 28 on truman.experience.com. Students should dress business casual and are welcome to stop by the Career Center for a resume critique. To attend, a student must be nominated by a faculty or staff member. To nominate a student, submit the following information to ucc4@truman.edu: student name, student email and which workshop they can attend. Additional questions can be directed to ucc4@truman.edu. "Charting Your Future in Politics and/or Law: How to thrive in law school and guarantee success in Challenging Economic Times"
The Multicultural Affairs Center, University Career Center and HALO will be hosting alumnus David Lee Bonner (‘07). Bonner graduated from the University of Wisconsin, Madison law school and is an assistant attorney general in the Illinois Attorney General’s Office. As an assistant attorney general in the General Law Bureau, Bonner litigates and prosecutes employment discrimination and minimum wage and prevail wage violations in federal and state courts. Bonner also handles settlement cases in Chicago. Bonner has been very involved in politics. In 2004, he interned for Barack Obama’s U.S. Senate campaign. In 2008, Bonner rejoined Obama for his presidential bid as a campus counsel in the campaign’s legal division. Come to hear about his academic and pre-professional preparation at Truman, his law school experiences, his political stories, and now, what it’s like to be a practicing attorney. The Multicultural Affairs Center and University Career Center will be hosting alumnus Anthony I. Butler. Butler received his B.A. in political science from Truman and his juris doctor from the St. Louis University School of Law, where he earned an Employment Law Certificate, was on the Mock Trial team, and received the International Academy of Trial Lawyers Student Advocacy Award. Currently Butler is the managing principal of Butler & Associates, a law and consulting firm headquartered in Baltimore, Md. As a trial attorney, he assists families and businesses with a variety of legal issues. Butler advises his clients on business organization, criminal defense, contracts, employment law, family law, personal injury and trusts & estate matters. In addition to his law practice Butler serves as a regional managing director with Vantage Solutions, LLC. As a consultant he advises clients on a variety of human resources and employment law matters including the development of corporate diversity strategies, the development and implementation of anti-harassment and discrimination policies, executive coaching and training, and the development of strategic recruiting initiatives. At this event Butler will talk about his academic and pre-professional preparation at Truman, his law school experiences, beginning and sustaining a successful law and consulting firm and what it’s like to be a practicing attorney. Detours Magazine is accepting entries for their biannual photo competition themed “Energy and Motion” that is open to all amateur photographers. Students can submit their photos along with their name and contact information, location of the photo and a short caption. Submissions may be sent to photos@detoursmagazine.com by Sept. 30. Two winners will be featured in the Winter 2011 issue and will be notified in October. 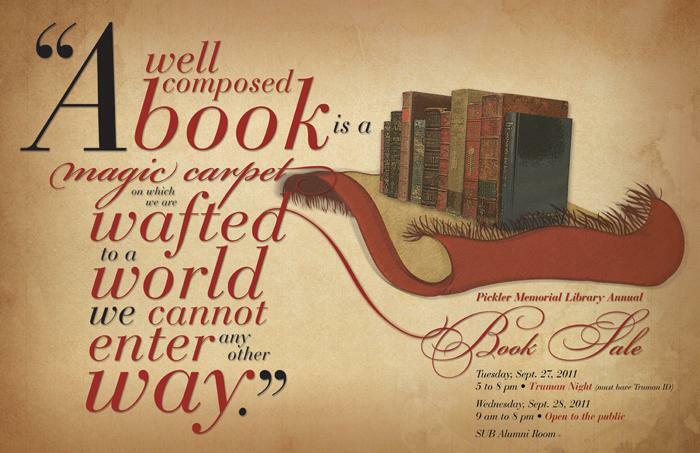 The 6th Annual Pickler Memorial Library Book Sale will take place Sept. 27 from 5-8 p.m. and Sept. 28 from 9 a.m.-8 p.m. in the Student Union Building Alumni Room. The evening of Sept. 27 is Truman Night (you must have a Truman ID to enter). There will be live music by the Truman Jazz combo, refreshments and lots of good books at bargain prices. For more information, visit library.truman.edu/about-us/book-sale.asp. Information tables provided by representatives from a variety of energy companies, including information on the Truman Sustainability committee. All are invited to attend the summit, but reservations are requested by calling 785.4016. Tickets are free for Truman students, staff and faculty and $5 for general admission. They may be picked up at the SAB Office in the lower level of the Student Union Building. Homecoming apparel orders are available online until Sept. 23. Go to homecoming.truman.edu and click on apparel. Apparel will be sold in the Student Union Building starting Sept. 26 at the Homecoming apparel table from 10 a.m.-2 p.m. For more information contact the CSI at 785.4222. The Office of Citizenship and Community Standards (OCCS) is seeking motivated students to serve as student affiliates on the University Conduct Board. The University Conduct Board hears cases of alleged misconduct to determine whether a student or student organization’s behavior violates the Student Conduct Code, and if a violation is found, the imposition of sanctions. The board is comprised of faculty, staff and student members. Student members would be expected to serve on the board for various hearings each semester as well as participating in various social justice and civic projects on campus. This is a great opportunity for students to serve the University and improve a resume. The application to serve as a student member may be found at conduct.truman.edu. Applications are due Sept. 30, by 5 p.m. in the Student Affairs Office located in the Student Union Building 1110. All information, rules and registration requirements are online at recreation.truman.edu/intramuralrec.asp, or contact the Intramural Office at 785.4467. Captains’ Meetings will take place at 4:30 p.m. in the SRC Conference Room. *Must register through the Advancement Office, McClain Hall 205.
AES Engineers is providing $500 scholarships to high school seniors or college students, regardless of courses being studied, who meet certain criteria. Scholarships are intended for future leaders across a wide spectrum of fields of study. Students must submit an essay of no more than 1,000 words in answer to one of the questions posted at aesengineers.com/scholarships.htm. Deadline for entry is Oct. 7. Anthony Blades, blindness skills specialist, will hold a workshop, “The Expanded Core Curriculum for Students With Visual Impairments,” from 10 a.m.-3 p.m. Oct. 6 in Violette Hall 1312. This workshop is free of cost. Blades will hold another free workshop, “An Introduction to the Nemeth Code,” from 10 a.m.-3 p.m. Oct. 13 in Violette Hall 1312. For more information, contact Blades at ablades@truman.edu. An informational meeting for the Truman-China EFL Internship Program will take place at 7 p.m. Sept. 20 in Violette Hall 2351. The program provides opportunities for students to teach conversational English in Guangdong Province, Peoples’ Republic of China in the Spring semester for 12 credit hours. For more information, contact Timothy Farley at tfarley@truman.edu. An international graduate school consortium is coming to campus at 1:30 p.m. Sept. 21 in the Student Union Building Georgian Room A. The session will feature several universities and provide information to students about their graduate degrees and careers in international affairs. The Center for International Study Abroad is holding an informational meeting with Gregory Lewis, representative from Missouri-London program at CAPA London Center from 4-5 p.m. Sept. 21 in the Student Union Building 3201. There will be a physics colloquium at 4:30 p.m. Sept. 21 in Magruder 1000. Kenneth F. Kelton from the department of physics of Washington University, St. Louis will be presenting “Getting the Hot Structures: Containerless Studies of High Temperature Liquids.” Snacks will be provided. For more information, visit physics.truman.edu/colloquia/mainstage.asp. The Lutheran Student Fellowship and Tau Lambda Sigma will host a 5K CROP Hunger Walk/Run at 9 a.m. Sept. 24. Registration is $5 with 25 percent of the proceeds going to local charities and 75 percent going abroad. There will be registration on the Quad from Sept. 19-23. The 5K will begin on Franklin Street by the Student Union Building. Participants should arrive by 8:30 a.m.
Yoga on the Quad will take place from 10:30-11:30 a.m. Sept. 24. Visit recreation.truman.edu for more details. This event is sponsored by the Student Recreation Center’s Fitness/Wellness Program. President Paino will host a “Coffee with the President” from 2:30-3:30 p.m. Sept. 27 in the Student Union Building Conference Room. The regularly scheduled “Coffee with the President” events are part of Truman’s effort to keep the lines of communication open between the president and the campus. Sessions are intended to provide an opportunity for individuals to ask questions about issues facing the University. Visit president.truman.edu/Coffee%20with%20the%20President.asp for more information. The McNair Program will hold an informational meeting at 3:30 p.m. Sept. 29 in the Student Union Building 3200. Students are also invited to visit mcnair.truman.edu or contact Sarah Hass, program coordinator, at 785.5393 for additional information. The deadline to submit McNair applications is Nov. 1. The Center for International Study Abroad will host speaker, Phoebe Mayer, to talk about studying abroad in Austria from 4-5 p.m. Oct. 18 in the Student Union Building 3204. The third Annual Interdisciplinary Biomedical Research Symposium will take place at 8:30 a.m. Oct. 22 at the Connell Information Technologies Center at A.T. Still University. The event is focused on faculty-mentored student research in biomedical science. Students are encouraged to register and submit an abstract. Visit www.zoomerang.com/Survey/WEB22CV64NP3DT/ for registration and submissions. The deadline for registration is Sept. 30 and for submission, Oct. 7.